​A dressage test describes figures and movements that must begin, end, and span the arena precisely. To ride them correctly, the specific geometry of the dressage arena must be in your head. And the best way to learn visualize them is to DRAW your tests. You probably know that a dressage-arena is measured in meters. You probably have also noticed that meter measurements keep cropping in your test instructions. But you probably also think that improving your scores simply depends on spending more time in the saddle, riding your test figures over and over. Nothing could be farther from the truth. Two articles in the April 2010 issue of Dressage Today made this perfectly clear. Both stressed that that dressage riding is just as much a mental skill as a physical one. And with all of its circles, serpentines, and precisely timed transitions, much of this mental skill is visualization. Hilary Moore, dressage instructor, FEI competitor, and USDF associate instructor stressed the importance of DRAWING your dressage tests, especially at the lower levels. "Draw your test movements", she states, "so that you know what each should look like, including the exact geometry of the arena. You need to know exactly where your figures hit each point." Why does this matter? Janet Foy, an FEI "I" and USEF "S" dressage judge explained that the most common errors riders make at the lower levels is riding incorrect figures. She often asks riders how many meters are between the letters, and is dismayed to find they have no idea. She points out that it isn't possible to ride accurate circles if you don't know this. For example, she states that at Training Level championships, most riders execute ovals, not circles, because they use the RSVP letters in the center of the dressage-arena as circle points. But these letters define an oblong rectangle, not a square. So when you ride your "circle" inside this imaginary rectangle, you end up riding an elongated oval. As she puts it "And, if the first horse puts the wrong footprints in the sand, the rest will follow. " The judge must penalize you for these inaccuracies. And as riders progress through the levels, the circles get smaller so the errors become more frequent. Another common problem these experts report is not riding deep enough into the corners of the dressage-arena. As Janet Foy points out, this is because they are used to riding circle lines and don't realize that circle lines don't reach into the arena corners. This will cause problems when you set up transitions at the next letter (such as C) because your horse won't be parallel to the arena boundary, that is, his body won't be straight. It will also cause problems for movements that require you to ride diagonally across the arena because your horse won't have time to make the proper turn onto the diagonal. Riding deep into the dressage-arena corners allows you set these moves up properly. 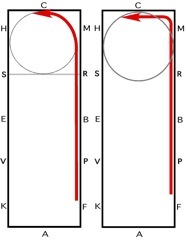 The answer to these problems, according to these experts, is to draw your tests on a geometrically correctly scaled dressage-arena template so that you see and feel how the figures fit into a standard dressage arena. 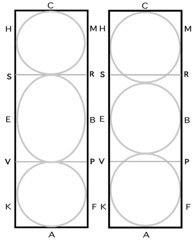 When you do this, you will see that riding a 20 meter "circle" using RSVP as anchor points gives you an oval, riding a 15 meter circle using the centerline as a boundary gives you a 10 meter circle, and riding on 20 meter circle lines between A and K, F and A, C and H, and M and C will not put you deep enough into the corner to set up your next move properly. There are many movements in Second Level tests and above, and little time to think about them. That means you must have them memorized and visualized. You must have a mental diagram of the arena in your mind with the transitions clearly marked and the span of the circles, serpentines, and half circles accurately represented. Dressage Judge Betsy Berrey and renowned dressage trainer and champion competitor Christopher Hickey point out that drawing your tests "will help you to understand where each movement begins and ends. There are no gray areas in a test - every stride is counted in one movement or another…You can use small drawings of the arena and do each movement in one color per level or in different colors for walk trot and canter." You can draw these templates by hand on paper, or design them on your computer and print them. But you will end up going through a good deal of paper and printer ink because these experts also recommend drawing your test repeatedly until it becomes second nature to you. Fortunately, there are wonderful drawn-to-scale dry-erase dressage arena boards available for purchase, which you can find below and at Dressage Extensions.com. If you follow these experts' advice, you will be sure to improve your dressage scores in no time!